A few years ago we were pottering round New Zealand. We'd had a particularly terrific day driving from the Northern Most Point of the North Island, down the Western Coast to where that particularly long beach gets interrupted by an inlet, so we pulled into a carpark on yet another scenic headland. It was just a typical Kiwi scenic headland, where you leave the car, walk for twenty minutes, get drunk on the natural beauty that surrounds you, then stagger back to the car to repeat the process at the next headland. The car parking arrangements we found to be typically as ruggedly natural as the coastline, usually there’d be a bit of a track, a clearing, and a few wheel ruts in the soil to show you where others have parked before, and this place was almost no different. The difference was a nondescript white Japanese car of inderterminable age, but quite second-hand and of the type that flooded into the country under the banner "cheap imports" and it was parked smack beside the entrance to the pedestrian track. It was impossible to get to the headland track without walking past its open window. If the sandwich board hadn’t attracted our attention, the personalised plates may have, although it's occupant cerrtainly did. It was difficult to gauge much of the person within, as all we could see in the gloom of the interior was the fluorescent grey moustache which seemed to fill the almost the entire volume of the car, leaving only just enough room for one of those kinds of beards which we are led to believe were favoured by the bushrangers of old. It seemed we pressed some sort of button, because the moustache erupted into speech, assuring us that “they” come up from the city, and wreak havoc among the parked cars, pinching radios, breaking windows, bending aerials; that sort of thing. 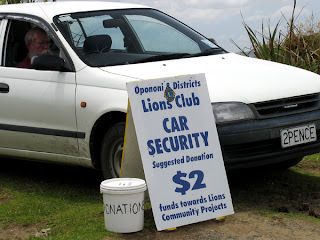 The Lions club are doing this as a service, they don’t make much money out of it, but it’s bad for business in town if tourists’ cars keep getting trashed, it explained. It didn’t know what the world was coming to, but it did offer that the Maori’s had a word for the sort of people who perpetrate the sort of anti-social behavior in question. Well, we’d been in the land of his long white beard for a few weeks, and were starting to get the hang of pronouncing about every fifteenth word we’d seen in the Maori language, so were pretty keen to expand our vocabulary.